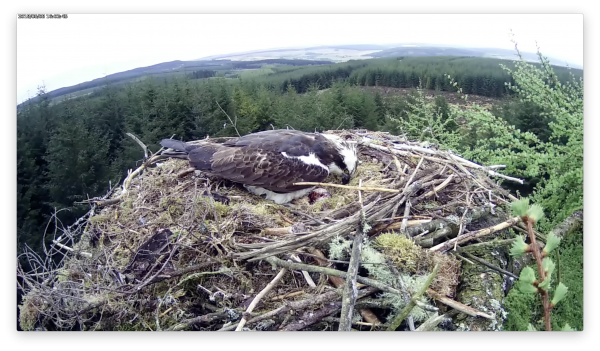 Following a slow start to the Kielder Water & Forest Park osprey season, hampered by the Beast from the East, the breeding season is well underway with three eggs in each of the four nests. There was a question mark over whether this would happen as unfortunately, the male from nest three did not return from migration. However, a new male found the nest and has formed a successful new partnership with the female. The first eggs will begin hatching at the end of May and into June. This season, Northumberland Wildlife Trust have appointed Ellie Kent to be the Kielder Osprey Assistant. Ellie, who hails from Gravesend in Kent, holds an MSc in Conservation and Biodiversity from the University of Exeter. Prior to that, she studied for a BA in Philosophy at the University of Sussex. Fuelled by her love of birds and wildlife, she has worked for conservation organisations in the UK and internationally for the past six years. Visitors can watch the birds on three of the nests through nest cameras broadcasting at Kielder Castle Café. For a chance to see these magnificent birds, join Northumberland Wildlife Trust volunteers at Northumbrian Water’s Kielder Waterside every Saturday, Sunday and Bank Holiday Monday, with additional Wednesdays in July and August to view Nest 1A and 2 through a scope and see live footage broadcast from the nests to a screen in the cabin. Fans of the famous birds can also keep up to date with them by checking the blog at kielderospreys.wordpress.com. Kielder Osprey Watch is a partnership between Kielder Water & Forest Park Development Trust, Forestry Commission, Northumberland Wildlife Trust, Northumbrian Water and Calvert Trust Kielder and is funded by players of the National Lottery through the Heritage Lottery Funded Living Wild at Kielder project.